John* is worried. His tooth has been hurting for a few weeks. It started small. He first noticed pain when he chewed with certain teeth, so he started chewing on the other side of his mouth. That helped at first, but the pain changed. One of his teeth started to hurt whenever he would drink something hot (like coffee) or cold (like a soft drink). Now, he has lingering pain that is getting worse by the day. He also has developed what looks like a pimple on his gums near the tooth that hurts. He doesn’t think that’s just a coincidence, and he’s worried that he will need a root canal treatment. Yet, he still wants to put off the procedure because he’s worried that’s going to hurt, too. At Sunrise Dental, our dentists don’t want to see our patients in pain. We want to alleviate your pain and remove the infection that is causing it. And if John comes to one of our offices in Chapel Hill, Durham, Raleigh, or Cary, then his root canal treatment can be pain-free. Would You Leave A Splinter In Your Foot? Let’s imagine for a moment that you were walking through your backyard barefoot. You don’t notice a splintered limb that has fallen from a nearby tree. When you step on the branch, you accidentally drive a splinter into your foot. At this point, you know you have a problem (you have a splinter in your foot) and that has a consequence (your foot hurts). Would you continue walking? Would you change how you walk to avoid stepping on the splinter? More than likely, you would try to remove the splinter as soon as you could. Now, let’s assume that you break the splinter during your attempt to remove it. You get part of it, but another part pushes deeper into your foot. If you leave the splinter there, it may cause an infection that will cause the pain to get worse and worse, and that really will limit how well you can walk. How long would you leave the splinter in place before you got help? This is what John did in our introduction. His initial pain was a sign that something was wrong, but he ignored it either because he didn’t think it was that bad or he thought it would go away on its own. Tooth Infections In John’s case, he had another warning sign long before his tooth started to hurt. He was showing symptoms of gum disease. He didn’t floss daily like he should, and when he did, his gums would bleed. Instead of continuing to floss —which could have removed the bacteria and plaque that are causing the problem, and thus, reducing his bleeding — John stopped flossing. As his gum disease progressed, a pocket formed inside his gum tissue near the root of one of his teeth. Bacteria built plaque, which hardened into tartar, and the bacteria attacked the outer layers of his root. Eventually, the bacteria reached one of his root canals, openings in his tooth that contain blood vessels, nerves, and pulp. This pulp is a soft connective tissue that can become inflamed when it is infected. And that can be painful. 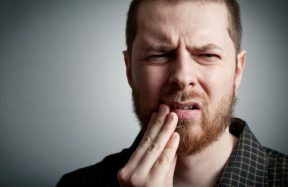 Treating Infections A root canal treatment is intended to remove the infected material from your tooth, just like removing the splinter from your foot that has caused an infection. At Sunrise Dental, we want your root canal procedure to be pain-free. One way we can do this is through sedation dentistry. Whether you receive nitrous oxide or oral conscious sedation, you won’t feel a think during your root canal treatment. After you are sedated, we will remove the infected pulp along with the nerves and blood vessels in your painful tooth. We will clean and sanitize the tooth, fill it, and seal it. This removes the bacteria that caused the problem and reduces the risk of a recurring infection. You may feel some soreness in the days after your treatment, but you should notice that the pain is going away instead of getting worse. Don’t Be Like John * John may not be a real person, yet too many real people react to tooth pain in the same way that we described above. Don’t be one of them. Be proactive at the first sign of a problem. This may prevent the infection from happening or you may be able to remove the infection before it becomes too painful to bear. Our dentists in Chapel Hill, Durham, Raleigh, and Cary are waiting to help. All you need to do is call or use our online form to make an appointment. The pain in your tooth isn’t going away unless you do something about it.